Sophia Xeros-Constantinides is an artist and clinician working with perinatal mother-infant distress. She is currently undertaking research for a PhD in Fine Art at Monash University, exploring the visualisation of women's reproductive experiences and the maternal-infant relationship. Xeros-Constantinides works in a variety of media, including drawing, printmaking, digital photography and collage. Whilst acknowledging and celebrating the wonders of procreation, she is aware of the enormous risk and cost falling to women in their reproductive lives, not least in terms of mental health and well-being. 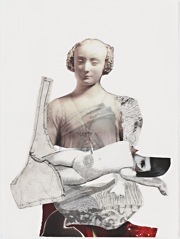 She uses collage as metaphor for the schisms and disruptions which confront women in their reproductive quest. Xeros-Constantinides' work has been exhibited nationally in the Fremantle Print Prize (2010), in the 2010 Swan Hill Print & Drawing Prize exhibition, and in the 2010 Beleura National Works on Paper exhibition at the Mornington Peninsula Regional Gallery. Her work has been acquired by the Dax Centre in Melbourne, a National collection of art pertaining to mental health and psychological trauma. In this paper, I explore perinatal experiences in relation to fear, from clinical and theoretical perspectives, and visually, by examining the maternal print archive. I pose questions about perinatal ideals and realities, and present imagery to support the idea of a 'fearsome' perinatal space. The reader is invited to re-assess the implications of motherhood for women, based on documentation of lived experiences found in writing and drawings, and on insights of analyst-therapists who have worked in therapy with pregnant women and new mothers. I examine a broad range of imagery from the maternal print archive (including drawings, digital prints and collages) for visual metaphors of fear, analysed in terms of the threat to physical and mental integrity. The intention is to lift the veil from idealized depictions of motherhood as they are often presented in popular culture, to uncover alternative realities, and to give voice to women's lived (maternal) experiences of vulnerability and ambivalence. I appraise Adamowicz's description of collage as an 'encounter between disparate realities' and find resonances with the clinical description of the pregnant state ' both house juxtapositions and disruptions which undermine the status quo. Finally, I examine the place of collage as a medium for the representation of perinatal fear in relation to my own collage works and drawings, and in relation to the maternal print archive.